Read Liz's blog, A Pub Landlady's Life, here! 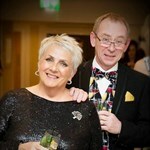 This is us - He's Tim and I'm Liz, together with our fantastic team we run the Victoria Inn in Salcombe! We've been here since 2008 and my goodness what an amazing time we've had.........We had 8 people working with us when we started and now we have 30!! Being a publican is what Tim has done for almost 30 years, and before we came to Salcombe I had a lengthy Local Government career. With both of us coming from big cities we found Salcombe really different - but in a great way! We've worked our socks off and now feel part of this great community, we've made our home here and have lots of lovely friends - many of whom started out as customers. Getting to know Fishermen and Farmers and sourcing some really great local produce has been a highlight of being here and I still often pinch myself everytime I look around at where we live and work. We are very proud of 'The Vic' and what we've achieved so far - but the story will go on for a good many years yet. If there's anything you'd like to see us do or add to your experience - please talk to one of us or our great team, if you'd like to read more about the daily stuff we do then have a look at my Pub Landlady's Blog which I write as often as time here allows.